Žydrūnas Ilgauskas is a Lithuanian professional basketball player who currently plays for the Miami Heat of the NBA. He plays the center position. Appeared in 64 games (six starts) for the Cavs and averaged 7.4 points (.443 FG%, .743 FT%), 5.4 rebounds, 0.78 blocks, 0.5 assists and 20.9 minutes…was traded to Washington on Feb. 18 but did not play a game for the Wizards before being released on Feb. 25 and re-signing with the Cavs on Mar. 23…missed one game as a DNP-CD with the Cavs and four games as a healthy scratch on the Wizards inactive list…became the Cavs’ all-time leader in games played on Dec. 2 vs. Phoenix…topped the Cavs in scoring once, in blocks 19 times, in rebounds on nine occasions and in steals in three games…scored in double figures 19 times, including one 20-point performance…grabbed double-figure rebounds four times…Season Highs: 25 points (at Sacramento, Dec. 23), 12 rebounds (vs. Orlando, Apr. 11), five blocks (vs. Charlotte, Oct. 31), four assists (vs. Philadelphia, Nov. 21), two steals (vs. Utah, Nov. 14) and 34:00 minutes (vs. Philadelphia, Nov. 21). Ilgauskas married his wife, Jennifer, during the summer of 2004. In the summer of 2009, Ilgauskas adopted two Lithuanian brothers (aged five and four at the time) from his hometown of Kaunas. 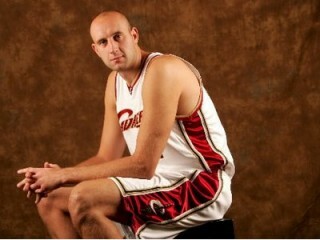 Ilgauskas is an avid reader, of military history in particular, and often reads in the locker room before games.